Exchange your STEEM and SBD for a STEEM VISA® GIFT CARD and other eGifts. which can all be purchased using steem, steem dollars, bitcoin, and litecoin. 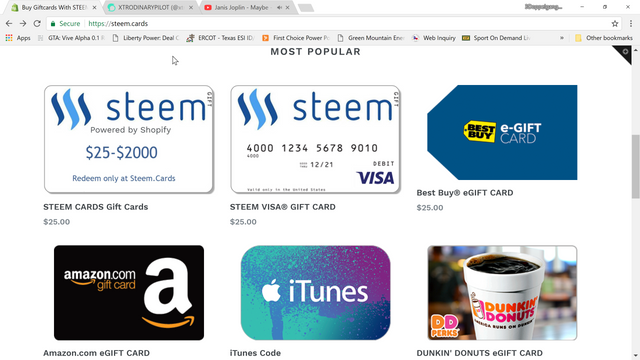 Go to Steem.Cards (it is recommended that you log in to steemconnect.com before shopping). Go to the cart to checkout. If you chose a plastic Visa gift card, a shipping address is required. Choose payment method (steem/sbd, bitcoin, or litecoin). Upon choosing steem/sbd, you will be forwarded to steemconnect.com to finalize your payment. Upon choosing bitcoin or litecoin, a pop up window will allow you to finalize your payment. Steem.Cards is an old idea but a new project. We are starting out with about 20 items in our store and will expand our selections daily. I would like to see 100 items for sale by the end of Feburary 2018.Currently we are utilizing an api approved by Black Hawk networks on the back end. We are working on a full api integration by April 2018. This project is made possible by following @adept's tutorial on adding steem payment options to any Shopify store. Wow this is what I was waiting since a long. This will really make the steem more adaptable. Oh my god I’m gonna get one of these cards . Resteemed. I also just bought a $100 amazon card. You should mention there is aa 10% markup in the price of cards. it's unclear if that's going to email me a card or mail me one. Please get me some answers and I'll make a separate post about this service. I just received my giftcard. It works. Nice job fellas. I'll make a post about the experience. Thank You @aggroed We are currently working to make the necessary updates and improvements. So how is with that omni cards. 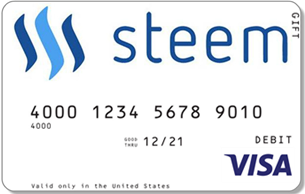 I am looking for an anonymous steem debit card, more than gift card. I would agree @aggroed, the card fee needs to be clearer on the site...although I have to say, $7.95 for a $500 Visa pre-paid card would be a lot cheaper than the 10% or so in fees it would likely take to convert the SBD/STEEM into fiat, given what I believe is a fairly convoluted process to get there now you know. Also...does the fee increase with value of the card? Is there a difference between the cost of putting $25 on the card as opposed to $100? I'm asking you 'cause you've already went through the checkout process. If I'm not understanding something correctly, please enlighten me. The fee is a flat 10% on all store brand cards. $7.95 USD and standard shipping are the only fees asssociated with the Visa Prepaid card as it has to be printed. Ok...so NO 10% fee on the Visa Cards? Just the $7.95 +shipping fees on those? 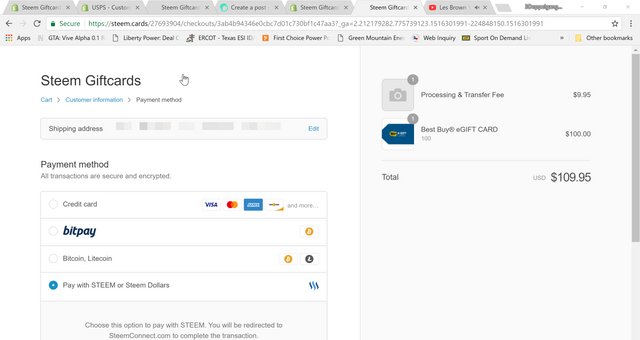 @steemgiftcards Is this card rechargable or do you have to order a new Visa card the next time? As far as the aesthetics concerning value symbols, I will have that cleaned up. Now for the part everyone wants to know about. Yes there is a 10% per associated with using our service. When utilizing the api, Steem is converted to USD via BTC and there is a fee associated with that. In an effort to speed up the process, we are accepting unconfirmed btc transactions which requires mining fees. 10% won't always cover the full amount. any ability to switch to ltc? or bitcoin cash. That would be contingent on Blackhawk Networks as they are are ones facilitating. We are definitely pushing toward a very little to no fee at all, but that only comes after we demonstrate an ability to market and handle volume. Super interesting. In general this effort is helpful for those of us who still communicate with friends who are mostly not on steemit or in crypto. These types of initiatives help our community over all. I look forward to future developments, using this in the future, and sharing those views. Til then just sharing this info is a big help to us all. Thank yous! Great to see. Having more conversations with non steemit friends. This helps the dialogue. Are cards valid worldwide or only in USA? 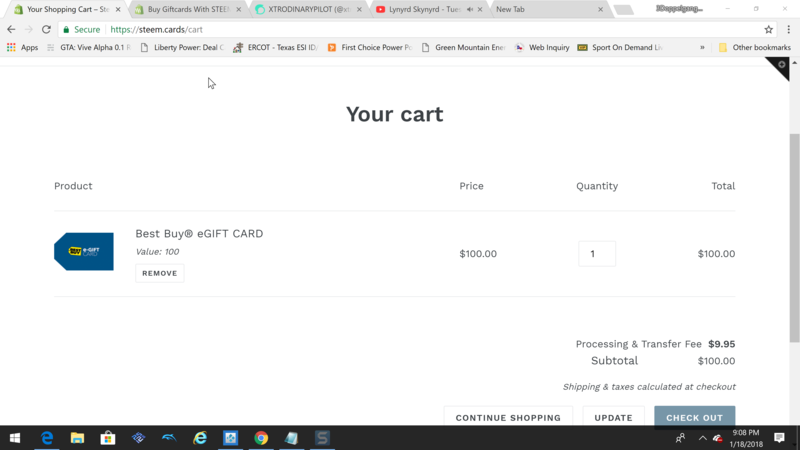 Your website is asking me to pay 15,742 SBD for a $100.00 e-GIFTcard. This idea is gonna change some things for me. Definitely helps me prove how lucrative some earnest interaction can be. $9.95 processing fee is higher. Also, it's not showing the total in STEEM instead it is showing in Dollar. YO!!!! I was just reseteeming this and look who I see???? Let me see your pic in that man! I love it...let us see your face though loOOOOOOll!! This looks like a great service, even with fees. Can you refill the Visa cards? Wow. I'm new to Steemit and I was wondering today how I would "cash out" after I earned anything on the platform. Now, I don't have to jump through hoops to figure that out. Thank you so much for this. I appreciate you and this new community! If you purchase the VISA gift card then it can be used anywhere VISA debit cards are accepted. If you purchase an eGift Card, they can be used only at that retailer. @steemgiftcards great project. This is great development for all steemians. I wish all the luck to you guys. You guys are putting lot of effort to make lives of steemians easier. Thanks. M sure many more features will be added to this in near future. Looking forward to it. Coinbase wallet to finally turn the BTC into USD in the bank. Is this correct? 'Cause, if it is, your store would save me a boat load in fees. At the moment the cards cannot be reloaded. It's a feature that requires that certain banking standards are met which are working on. There is a reloadable card in the works. Ok. Thank you for the reply. So there is a 10% fee on top of the card cost, which is $7.95 correct? 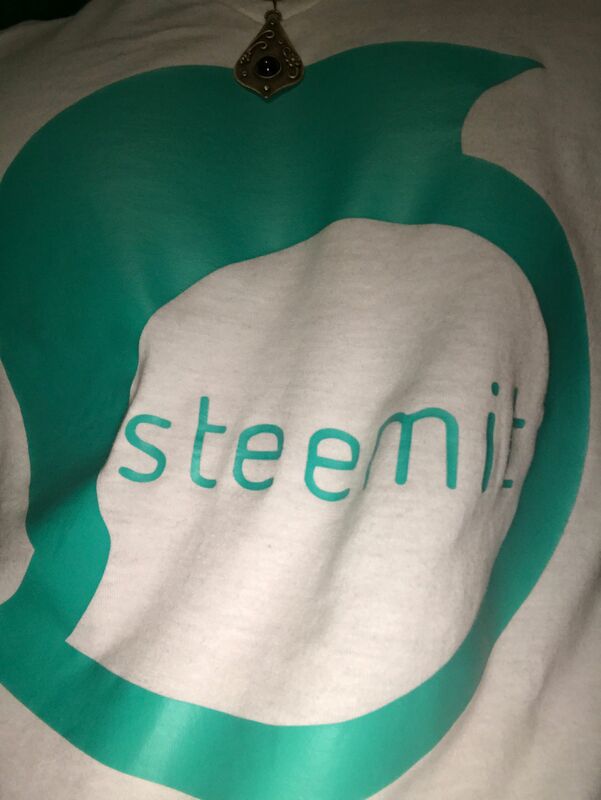 That's awesome, I have been a little anxious and confused by the prospect of trying to convert STEEM into something useful, I am sure it is a problem for other people too. This will help build the whole platform! This is so damn awesome. Thank you sir. We will be expanding our product list daily. You're so nice for commenting on this post. For that, I gave you a vote! Nice! Awesome! Where can we find the current product list? Fantastic work!! Congratulations to @steemgiftcards!! Is only for Amazon.com or also for Amazon.it for example? This is great!!! I would be very interested in a reloadable card!!!! A reloadable card would be most ideal. Instead of waiting for gift cards to be delivered which could take some time depending on where you live. More gamechanging in the crypto space keep popping up. Avoiding exchanging to fiat is my #1 goal these cards would definately help. That's interesting. With this feature i may now be able to buy stuff from Amazon.com without the need of having an international Debit Card or Credit Card. At the same time it makes the SBD that i earned usable. So does this just take from our steem or do we have to have it as sbd? So I can now buy at Amazon anything I want to with that card? Congratulations @steemgiftcards, this post is the eighth most rewarded post (based on pending payouts) in the last 12 hours written by a Dust account holder (accounts that hold between 0 and 0.01 Mega Vests). The total number of posts by Dust account holders during this period was 13127 and the total pending payments to posts in this category was $3417.14. To see the full list of highest paid posts across all accounts categories, click here. hey @schoonercreek, thought you may want to see this. not sure if it can help at all, but it may be an easy way to turn steem into money you can use? This a Great Post and Service we will be trying this out in the near future thank you for sharing this! Is the Visa card a physical one that is mailed to you or a digital card? Would like to be able to use it at the grocery store or for gas. The visa is a physical card that is mailed. Awesome! Thanks. :-) Very few places offer those, and most of the time they're smaller value ones. @bleedpoet, thanks for the business. We look forward to improving our speed of transaction as we grow. Your patience and is greatly appreciated. Wow this is awesome I’m totally gona check this website out thanks!! Congratulations! This post has been upvoted from the communal account, @minnowsupport, by xtrodinarypilot from the Minnow Support Project. It's a witness project run by aggroed, ausbitbank, teamsteem, theprophet0, someguy123, neoxian, followbtcnews, and netuoso. The goal is to help Steemit grow by supporting Minnows. Please find us at the Peace, Abundance, and Liberty Network (PALnet) Discord Channel. It's a completely public and open space to all members of the Steemit community who voluntarily choose to be there. So, i can fill a pre paid card with certain amount of money and use it as a regular card? Do you guys uship these cards internationally? Can i re fill the same card over and over? Unfortunately the Visa cards cannot be reloaded or shipped outside of the US. We are working feverishly to allow this. Oh i see.. as long as it is on your plans i am all in! Great idea! I'm going to share this around the social medias. 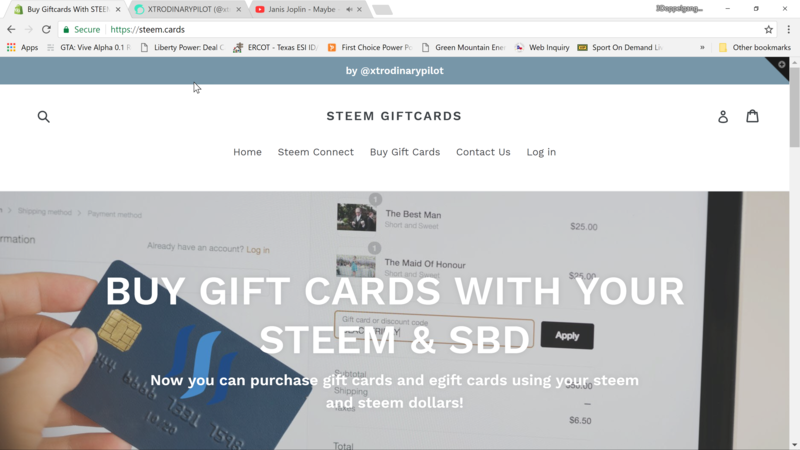 Thank you @steemgifcards, we are developing a new community and have been exploring flexible ways to monitize/utilize Steen/SBD. I will forward to my partners. can we get xbox live gold card added in the list possibly ? Can these be used in Canada? And which countries is this service available in? I think it's more than fair for the amount of streamlining it does in converting Steem to tangible goods and services. More than fair is right, considering currently someone would have to convert Steem-BTC, then BTC to USD to their bank. What types of products do you want to list? I have been researching Amazon's Seller Central to list a cargo pocket blow out kit I make. I'd rather sell it through steemit or similar however. I did a post about this card about a month ago. I was actually shocked to see it existed and had to write about once I found out about it. I think it is a grand idea but for one thing.... I HODL! At this point in my Steemian evolution I could nmot imagine parting with even ONE of my SBD's. I am sure the whales though are going to love this. Great coverage of the card. Much better than my post was. Excellent initiative One question, with the visa card can I verify a paypal account? We are exploring the options of expanding beyond the United States. We will know by the summer time if that is a viable option. If it will be possible, you could add gift cards to the UK version of Amazon. give us a week or so and we will have UK and Canada. Yeah, keep us Canadians in the loop too :) Looking forward to seeing options for us as well. That'll be amazing. Ah, looks like Australia misses out again. Would be great it we had something like this. I didn't know about this! Great. Thank you. Now this will help win people over for sure! about to try this in the next few days when I get a good payout I am so excited this may change my life!!! You're so nice for commenting on this post. For that, I gave you a vote! I just ask for a Follow in return! What a great innovation. I really love this and will give it a trial. wooo 44 minutes till a payout cant wait to try this. hey @steemgiftcards can I talk about you guys in my blog! Loved my amazon gift card. I want to tag you , link your website(wanna make sure I have permission first). I think this be very cool for newbies and are confused by exchanges! It really does take the guesswork out. Looking forward to hearing your reply! This is awesome and looking forward to being able to purchase some gift cards to make some purchases on Amazon and a few other stores.